Not surprisingly, most dogs don't seem particularly excited when it comes time to be put in a kennel. Who would be? But according to a new study, keeping our canine friends locked up doesn't just make them uncomfortable -- it may be literally driving them crazy. Researchers from the University of Bristol's Anthrozoology Institute recently examined videotapes of 30 police-trained German shepherds as they spent time in their kennels after work. What they found was that the animals showed tell-tale signs of extreme stress and even temporary mental illness. Hamish Denham, the study's lead author, says that even the highly disciplined police dogs appeared to lose it when kept confined, exhibiting manic behaviors associated with failing mental health. The dogs were recorded repetitively jumping and bouncing off walls, pacing back and forth, spinning, and walking in circles around the perimeter of their pens. The study notes that "some dogs may find isolation from humans particularly aversive, hence affecting their reactions both to being left in a kennel and to being taken to the veterinary surgeon." Researchers provide no definitive explanation of this behavior, but it seems rather intuitive. Extensive studies on the effects of solitary confinement of humans has shown similar symptoms of mental disorders -- with many considering the punishment to be a form of psychological torture. "Symptoms of this stress-induced canine compulsive behavior disorder can include spinning and jumping in the kennel, chewing incessantly, and jumping and pulling excessively if on a lead... Other more depression-like symptoms may include self-mutilation, lack of appetite and lethargy." The shelter says that in some cases, the effects of this illness can render dogs unadoptable. 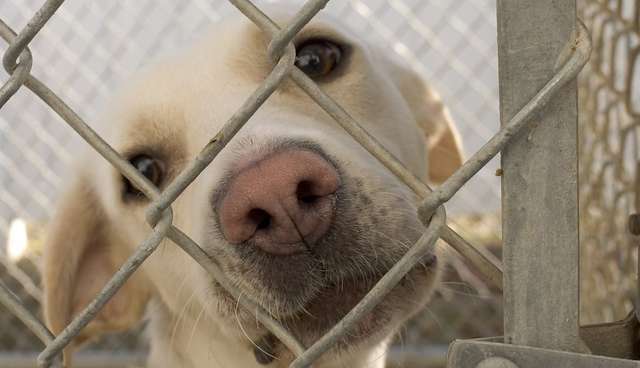 Sadly though, overcrowded animal shelters in the United States often don't have the time or resources to provide dogs with much time, if any at all, outside of their kennels -- leading to mental suffering that will go unresolved for many of the animals that fail to find a home.